It is indeed curious that this is an explanation given as frequently in Australia and New Zealand, as it is in Ottawa, Washington or London. Have all the teachers, in all these countries, just gone soft… and gone soft at the same time? Impossible as this would seem, so effectively has that message been communicated to the general public that the explanation has come to be seen as an accepted fact. And it is wrong, terribly wrong. 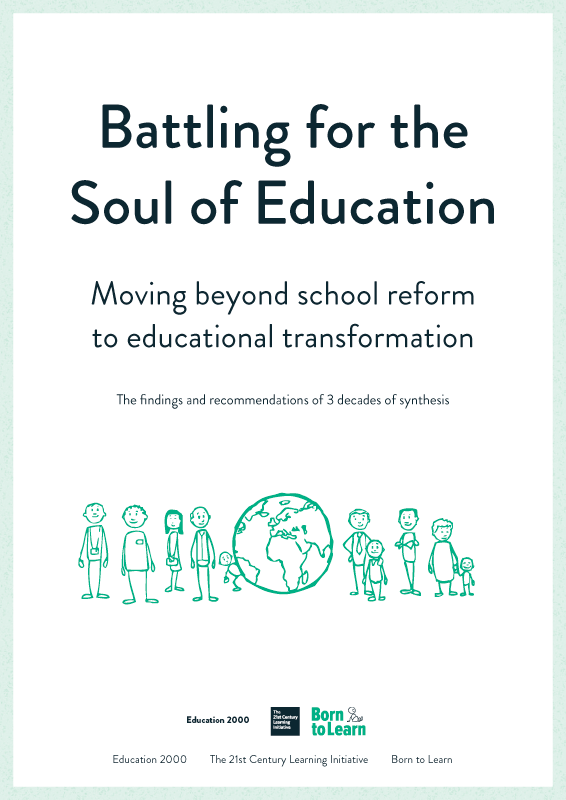 Consequently a whole generation of teachers, governors and administrators have now been drilled in the School Effectiveness Movement; what matters now, they have been persuaded to believe, are standards, accountability, and management by objectives. Despite mountains of legislation, and the expenditure of enormous sums of money, there is a creeping sense of fear at all levels that not only are the results (based on those factors most easily assessed) plateauing out, but that society as a whole (when measured in non material, quality of life indicators) is not significantly better off than it was before. Crime, alienation, and social decay in many different guises are obvious manifestations of what other research shows – namely that people are no happier than they were twenty or more years ago even though society as a whole is materially significantly better off. In fact we are less happy, it seems, and rates of clinical depression continue to climb. In separating out the craftsmen’s sense of pride and self esteem for “a job well done” from the quality of life available to those who conform, rather than genuinely create, it seems that we have created a society that no longer fits with the grain of the brain. Society is “out of sorts” with itself. Which has to be a significant part of the reason why so many young teachers in England resign from the profession within less than three years, and why so many headteachers seek early retirement, and why there are ever fewer applicants to replace them. All the above is, in its broadest sense, history and social commentary. It is nevertheless history that is vital to understand because the Synthesis which is emerging from research in various sciences suggests that the development of the school in the past two hundred years is, despite all its economic benefits, in human terms, an aberration. An aberration is defined as “a wandering of the intellect”, a “deviation from the normal type”, or the non convergence of that light needed to see the whole picture. Contemporary society in its attitude towards young people, has become like an express train that has been diverted from the main line – going to the wrong place, and fast approaching the buffers. Society it seems is losing sight of what actually makes it work. Schooling has come to emphasise in the early twenty first century, more than Roger Ascham could ever have dreamt, the triumph of the intellect over that of the applied. In so doing, this interpretation will argue, it has effectively devalued many of the skills that made us humans in the first place. Because of this (at a very deep, often subconscious level) we are losing the ability to be the all-round people that evolution has apparently equipped each of us to become. Robert Wright, one of the most respected writers on evolutionary psychology, makes the point that evolution has prepared humans to be an effective species, rather than a happy species. Humans all too often find that “to travel hopefully is better than to arrive.” A late eighteenth century Englishman, or Canadian, working on his farm, or in his shop, warehouse, or building a ship, might have struggled to make a living, but it is unlikely that he or she was depressed. In strictly evolutionary terms survival comes not to the most intelligent, nor to the strongest, but to the one who, in Darwin’s terms, “fits in best” – the one who is most adaptable, and most able to find a niche in collaboration with others. Successful living requires collaboration, as well as competition – it is this essential balance that a crude and over simplistic acceptance of the market economy has driven out of contemporary societies. Section Two. Synthesis. The more humans have come to understand themselves, and the world around them, the more they have found it necessary to divide knowledge into separate disciplines. Each discipline then develops it’s own theories, and methodologies. They may broadly study the same phenomena, but from such a different perspective that no coherent picture emerges. It’s like the Hindu proverb about three blind men trying to define an elephant; the first handles its trunk and says it is a large snake; the next feels its leg and says it is a forest, while the third feels its ear and concludes that it is a massive leaf! The magnificence of the elephant was lost because none of the blind men could comprehend the whole creature. In terms of the explanation made in this paper it has to be noted that a critical academic bifurcation – a splitting of the ways – occurred in the 1860s following Darwin’s publication of “The Origin of Species.” Medical science was moderately quick in the years that followed to see in the theory of evolution an explanation for so many of the features of human anatomy and physiology that have, subsequently. resulted in treatments which have greatly improved the quality and longevity of human life. But although Darwin speculated that evolution might eventually explain many features of human behaviour through the study of the evolved nature of the brain, psychology, as the study of human behaviour, was a very new and separate discipline in the 1860’s. Nineteenth century psychologists found the concept of “evolution in mind” too radical to handle. This was tragic because, for more than a century, until well into the 1970s, psychology largely ignored any evolutionary explanations for human behaviour. This was partly because such an idea offended many people’s spiritual beliefs, and partly because of the sheer impossibility of trying to understand the microstructures of the brain until the invention of brain scanning technologies in the early 1980s. Lacking such an appreciation of the evolved nature of the brain, psychology came to emphasise a highly behaviourist approach to human learning. Behaviourist psychology, led by J. B. Watson in the 1920s and 1930s, ignored all explanations for human behaviour that could not be observed, tested, and confirmed in a controlled laboratory environment. Drawing many of its conclusions from animal studies (Pavlov’s salivating dogs and cats) learning, Behaviourists concluded, was all about being taught. With the appropriate teaching Watson had argued, you could condition people in any way you wished. With sufficient pressure on teachers and pupils, latter-day Behaviourists still believe, every school should be able to improve its SAT scores by a given percentage as defined by an ambitious politician. Learning, they still argue, is controlled from the outside – they see it as a response to external stimuli… sticks and carrots of a certain size (and applied to teachers, as well as pupils). The first of the three new disciplines that need to be understood is Cognitive Science. Cognitive science owes its origins to a meeting at MIT in 1956 of psychologists, linguists and computer scientists who claimed that human minds and computers were sufficiently similar that a single theory –they called this a theory of computation – should guide research in both psychology and computing. Out of this theory cognitive science, as the “science of the mind”, was born. With this came the recognition that there are hidden causes of behaviour so rescuing psychology in the 1970s from the earlier, cripplingly narrow version of human behaviour that had dominated policy making for virtually half a century. A revolution in psychology was starting.